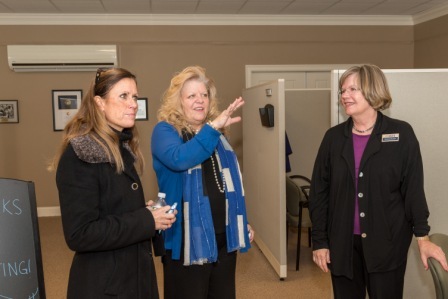 OCES recently celebrated the grand opening of our new “OCES Volunteer Center” at their Plymouth office at 204 South Meadow Road. The OCES Volunteer Center is a designated space for volunteers to work together on specific projects, such as Letter Writing to Troops for National Days of Service and Remembrance. It is also a place for prospective and current volunteers to talk one-on-one with Volunteer Program staff who can assist them in their search for volunteering opportunities that fit their skills and interests. 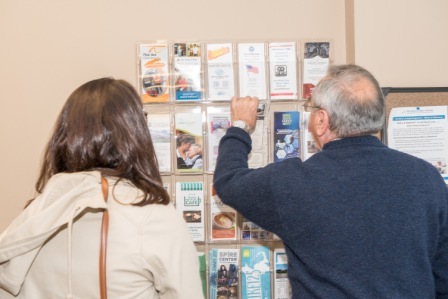 The Center has full service capabilities for researching volunteer opportunities including computers, phones, brochures and other literature from organizations seeking volunteers. OCES recruits volunteers of all ages for volunteer programs at OCES, as well as for other volunteer positions at nonprofits, government agencies, schools and other agencies in Plymouth County. Currently, OCES has 50 volunteers in the Money Management Program, and just over 350 volunteers in the Nutrition Program delivering meals to homes, to congregate sites, or helping out with the logistics in the 23 communities in OCES’ service area. Included in OCES volunteer programs is the Retired and Senior Volunteer Program (RSVP) of Plymouth County; which is part of the Senior Corps network of programs. Senior Corps is a program of the Corporation for National and Community Service, the federal agency for volunteering, service and civic engagement. OCES has more than 250 volunteers in the RSVP Program. Health and wellness are important to OCES, both for employees and volunteers. In the future, the Center will offer workshops and seminars on topics related to health and volunteer satisfaction. OCES will draw on its Nutrition, Healthy Living and Employee Wellness programs to provide these offerings. Our goal is healthy and happy volunteers who make a difference in the community. The OCES Volunteer Center will be open Monday, Tuesday and Friday from 10:00am to 3:00pm and on Wednesday and Thursday, by appointment. If you would like to learn more about volunteer opportunities at OCES, come for a visit, or call us any time at 508-584-1561.